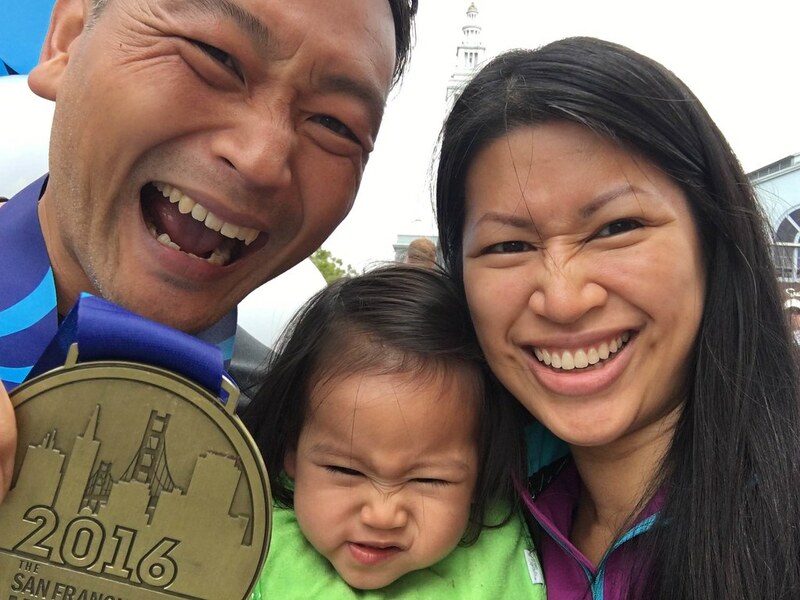 Last Sunday, I ran the San Francisco Marathon for the second time. It's my third marathon. It's been two years since the last one. I finished the 26.2 mile course in 3 hours 58 minutes, beating my record by 11 minutes. Finishing in 4 hours is a milestone for novice marathon runners. It is especially big for me. I trained for 4 months while I tried to equally share the daily responsibilities of raising Emi with my wife. I am an impatient and restless person. I always want "it" and I want it now. I always work hard for it. I often sacrifice sleep and peace of mind. Running marathon and taking care of our first baby changed my attitude. I cannot run a marathon without building the endurance patiently. Each time I participate in a race, it takes me at least 4 months of training; 4 days a week and around 30 miles per week. I was exhausted sometimes and the work could be stressful. Yet, I felt I had to, and I always wanted to, be cheerful to my precious daughter who has just started to find out what the life is about. Cheering someone cheers ourselves up - I knew in theory. But I don't think I practiced enough before I had Emi. Now it's becoming a habit. I think I am nicer to people than before. I am also hard on myself just too often. I am embarrassed about myself more often than I am proud. But finishing marathon in 4 hours made me proud of myself quite honestly. There is one more thing happened to me this year that made me proud: I officially started to work as a Data Scientist. Just a change in the job title does not make me proud. This is different: I joined FiveStars over 4.5 years ago. We were very small. We had a small office that looked more like a warehouse in Mountain View. From the beginning, I was very excited about the offline consumer behavioral data ingested through our services. But we merely had the first version of the software and we didn't have much customers and data yet. So, I worked hard with my fellow engineers to build the best product. Years later, our services are installed in more than 10,000 local restaurants and retails stores in 50 states, serving over 10 million people. We have data. It took me full 2 years of preparation. Coffee chat with CTO on our data and analytics vision. Dusting off the statistical knowledge and research methods from the college and PhD. Doing pet projects on Natural Language Processing and prediction problems. Building infrastructures and practices for our product team to run more experiments. I finally wrote up a proposal to create the new role so I can be more helpful to achieve the company's hyper growth. Here I am: the 1st Data Scientist at FiveStars. Age 13: Started to code. Coded in machine language because the chip was too slow for BASIC interpreter. Broke the hardware while hacking to extend the RAM with my bad soldering skill. Age 18: Studied international policies and economics at college. Age 20: Studied computational geometry and 3D data visualization. Age 21: Started a research career, collaborating with medical doctors. Age 25: Moved to USA by myself, working as a visiting researcher at Georgetown University Medical Center. Age 29: Life as a PhD student at Carnegie Mellon University. I was a Biomedical Engineering student, but sneaking into machine learning courses. Age 31: Got PhD but gave up on academic career. Switch the field to oil industry. Collaborating with geophysicists on the massive seismic data. Age 32: Personal investment and trade activities in a quantitative approach. Age 36: Joined the startup that is nothing to do with computational geometry, biomedical engineering or oil. Building product and team. I hopped around different fields. Social science, biomedical engineering, geophysics, and consumer internet startup. I loved being scholarly, but I hated the academic life. For a long time, I felt the path I took had zero integrity. I always had trouble telling what I am and what my professional theme is. I had bursts of interests, each lasted for a few years. Those intense bursts of dots at first didn't seem to connect at all towards the goal of finding myself. I took a winding road in my 20s and 30s. But I am catching up with the wise man at the age 40, at least in my humble way. I am not quite there yet to find what "the mandate of Heaven" is to me. But I have 10 years to find out. And this time, I am more patient and cheerful, thanks to marathon and parenting.